In my last post I wrote about the story behind Cosmetics a la Carte which can be read by clicking on the highlighted text. I have three pieces from the new collection to show you. The shade shown here is Romance a beautiful flattering soft pink cream that applies easily with superb pigment, you only need the smallest amount to achieve and English Rose glow to your cheeks, I really enjoyed this as I honestly prefer cream blushers as I have got older I find them more subtle and softer looking on the skin. Bare Blush Cream Blush is also available in Crush which is a beautiful soft Apricot. 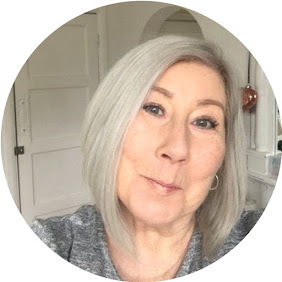 Regular readers will know that I am not a fan of Matte Lipstick I find them drying and unflattering in most cases and far more suited to younger faces. however........the Cosmetics a la Carte Colour Rich Matte Liquid lipstick could be the exception! I reluctantly tried it expecting to instantly hate it although the shade is just gorgeous. I was blown away by just how delicate it looked, it applied well wasn't drying or chalky and didn't make my lips glare out at me as flat matte often does, it felt extremely comfortable as though there was nothing on the lips at all, and talk about lasting power! I very much doubt there is anything on the market to rival it, seriously. Eat, Drink, Kiss do whatever and you will check the mirror and still have shade on your lips, it's quite unbelievable. I am definitely a huge fan. The shade shown here is Summer of Love also available is Summer Fling a soft Apricot. This little pot of joy will literally last you forever, a beautiful Rose Gold shimmer cream that applies easily to the lids or as a liner to enhance the eyes, totally smudge proof and crease proof this cream lasts for hours without budging, and the beauty is that you don't have to be a make up expert in any way to use it, a little smudge across the lid is all that's needed to instantly bring light and glow to your complexion.